NASHUA, N.H. -- Indiana Gov. Mike Pence, a potential dark horse for the 2016 Republican presidential nomination, told RealClearPolitics on Friday that he will decide his political future after his state’s legislative session adjourns in April of next year. Pence was in the first-in-the-nation primary state of New Hampshire on Friday to campaign on behalf of 2nd District U.S. House candidate Marilinda Garcia and gubernatorial hopeful Walt Havenstein. Unlike other possible 2016 GOP contenders, Pence has not been taking visible steps to pave the way for a White House run, and has appeared content to remain under the radar. After a roundtable meeting with business leaders here, it was New Hampshire GOP Chairman Jennifer Horn who suggested that the two get together for a private meeting the next time Pence is in the state. 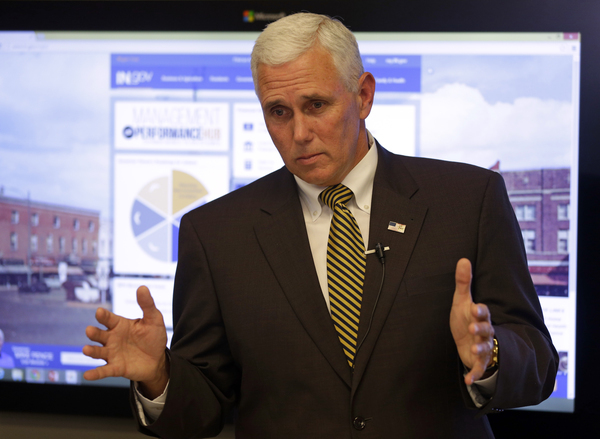 Pence -- a first-term governor, who previously spent a dozen years in the U.S. House -- told RCP that he is currently making plans to run for re-election in Indiana in 2016. But the deeply conservative governor, who generated low-key buzz in Republican circles as someone to watch during the last two presidential cycles, also dropped some hints that he is open to seeking the nation’s highest office. The suggestive remark drew knowing laughs from several of the local business leaders who had gathered in a conference room to meet him. A highly polished communicator and an evangelical Christian who is well regarded both within the GOP establishment and among conservative grassroots activists, Pence could present himself as someone who appeals to all factions of the party. He has long been a staunch supporter of diverting federal authority to the states -- an ideological bent that he emphasized repeatedly in the interview with RCP. Pence reiterated his call to repeal Obamacare “lock, stock and barrel” and predicted that while he believes Republicans will take control of the Senate next month and maintain its majority in the House, Washington will not become more workable until there is a change in leadership in the White House. Scott Conroy is a national political reporter for RealClearPolitics. He can be reached at sconroy@realclearpolitics.com. Follow him on Twitter @RealClearScott.